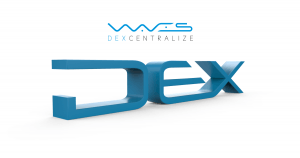 Launched in 2016, the Waves project has developed into an ecosystem consisting of a blockchain platform for the creation of custom tokens, a smart contract solution and a dedicated decentralized exchange named Waves DEX. Blockchain’s main task to ensure value transfer via “tokenization” of digital assets is often overshadowed by other considerations, such as the focus on smart contracts. The Waves platform wants to make it easy to tokenize, buy and sell various digital assets on crypto platforms, no matter which fiat or crypto currency is dominant in any part of the world. ICOs are an important component of the blockchain project launch, yet their creation is hardly an easy process. One of the main selling points of the Waves project is its intention to become a platform for launching initial coin offerings (ICOs) in a cost-efficient and user-friendly manner. The process of token trading following the project launch is often insufficiently supported on various cryptocurrency exchanges. 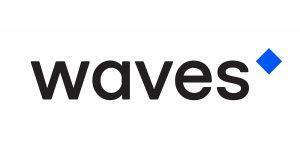 The Waves platform includes the Waves decentralized exchange (DEX) which allows its users to trade their mainstream cryptos for the Waves token or any other token created on the Waves platform. It also serves as the gateway to fiat currencies such as USD or EUR. Blockchain needs to be faster, scalable and decentralized. To improve on this, the Waves project includes implementation of the Waves-NG protocol which increases the platform’s throughput while speeding up the block creation times and reducing the potential for unneeded forks. Smart contracts mechanisms should be optimized for dealing with various assets. The Waves platform proposes to make this easier with its proposed implementation of the dedicated smart contract language named RIDE which enables creation of the categories such as “smart assets” and “smart accounts”. How Can You Use Custom Tokens Created on the Waves Platform? The Waves platform for custom token creation aims to become a versatile solution for various use cases on the blockchain. At the heart of this process is the "colored coin" method which involves management of real-world assets via their association with addresses on the blockchain. Tokens created on the Waves platform can be pegged to fiat currencies and other real assets, such as bonds, intellectual property, stocks etc. Creation of custom digital currencies by businesses that want to make them a means of payment for goods and services within a specific project. Securing crowdfunding for projects. Creating custom tokens means being able to transfer value in an easier manner since the tokens are customized in line with the needs of users and investors participating in an ICO. Custom-created tokens can also be used as the stake in decentralized voting model or as part of the rating system. Starting a customer loyalty or discount schemes featuring token-based rewards. Take, for example, what Burger King did with its Whoppercoin which was launched in Russia in 2017 with the help of the Waves platform. As part of its loyalty program, Burger King’s customers were given one Whoppercoin for every ruble they spent in restaurants. How Are the Transactions Managed on Waves? To make this possible, the Waves platform is designed to support both creating tokens and making transfers with them as if they were “attachments” to new transactions on the blockchain. This is done to get around the issue related to adding new transaction types to an existing network, which comes with the risk of having to deal with hard forks. The reason for this is the fact that a network’s client software needs to be updated to support these transactions. What the Waves platform does to contend with this is to treat the new transactions as plugins, meaning that they are not treated as the “core” of the client software used to manage them. Instead of this, these new transaction types are treated as “extensions” of the client software which means that the users can relay them and take part in the network’s operations, despite not having the appropriate plugins installed. This provides the third-party developers with the flexibility to create and offer new types of transactions within an environment which resembles application stores most of the users are familiar with. How Can One Create Custom Tokens with Waves? 1) First, you need to download the WavesLite app or go directly to the Waves website and look for the Waves wallet. 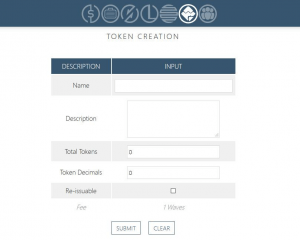 2) Selecting the Token Creation option allows for the customization of the token name and description, the planned supply of created tokens, decimal system etc. 3) Once these settings are made, you can either submit your token or restart the entire process. In order to create a custom-made token and get access to the Waves exchange, a user on the Waves platform will have to set aside 1 WAVES token (WAVES), while the minimum fee for the transfer of funds is 0.001 WAVES. As of late 2018, thousands of custom tokens (such as the aforementioned Whoppercoin) were created with the help of the Waves. Tokens are immediately tradable on the Waves’ DEX exchange. The Waves' decentralized exchanges DEX is an integral part of the platform’s ecosystem. As such, it is designed to support the platform’s token creation capabilities and offer basic trading functionalities with guaranteed anonymity. For starters, the users’ tokens on this decentralized exchange are stored directly in their wallets, reducing the hacking risks associated with the centralized exchanges. Similarly, the exchange administrators’ authority is also decentralized, meaning that no sanctions against the users’ funds can be imposed arbitrarily, such as in the case of having one’s funds frozen or imposing limits on their trading and withdrawing capacity. The DEX exchange has implemented an automated matching system for buying and selling orders as well as for the management of token exchange once the orders’ requirements are met. As the matchmaking software of the DEX platform is an open-source one, the nodes on the network can implement their own matchmaking systems and earn Waves tokens in exchange for handling trading transactions. Genuine liquidity with more than USD 6,310,000 as the average 24h volume. Lower fees, amounting to less than USD 0.01 (0.003 WAVES) per order. The exchange serves as the gateway for several fiat and cryptocurrencies, including EUR, USD, TRY, BTC, BCH, ETH, WAVES, ZEC, DASH, LTC and XMR. Unlimited withdrawal limits for cryptocurrencies. The exchange supports various devices, with supported browser-based access and dedicated mobile versions. In addition to its aim to win over the financial industry players, the Waves platform has to hope that these features will be sufficiently attractive to draw the users away from its immediate competitors such as 0x, IDEX and Kyber Network. What Does the Waves NG Protocol Bring to the Table? While the Ethereum platform and its ERC-20 token standard have become a popular choice for those who want to launch tokens through ICOs and create smart contracts, this hardly means that this solution is 100% watertight when it comes to various challenges. The Waves intends to make itself a suitable alternative by tackling the issues such as slow transaction speed, high fees and the lack of support for scaling. To that effect, the Waves network has implemented a new protocol called the Waves-NG consensus algorithm that is supposed to allow its blockchain to handle “thousands of transactions per minute” as well as preclude the creation of forks on the network. This solution was designed around the Bitcoin-NG technology proposed by Emin Gün Sirer and Ittay Eyal. The model does away with the principle of discovering blocks at similar intervals and having the new transactions processed once the miners get to submit them to the network. Instead of this, the Waves-NG model allows for selecting the miner in advance and having them create a key block which is automatically loaded with microtransactions without the need for the additional proof-of-work. This makes it possible for the Waves platform to confirm transactions as soon as its network allows it, thus increasing its processing capacity and speed. Waves-NG also aims to tackle the issue of the scalability bottleneck by having its network reach its highest throughput depending on the conditions and the state of the network itself. This is described as the strategy to minimize transaction latency, instead of going for reduced block intervals which can compromise security and increase the likelihood of forks. Unlike Ethereum, for example, smart contracts on the Waves platform do not require an equivalent of “gas” to be executed, requiring, instead, the payment of a minimal fee. In addition to this, the Waves team created a new programming language named RIDE, which was specially developed for the smart contract segment of the platform. RIDE language allows the developers to create “smart assets” and “smart accounts” as well as to move on closer to creating Turing-complete smart contracts. Smart assets are virtual currency tokens representing both tangible and intangible assets from the real world, all of which can be bought, sold and exchanged based on the script rules which are valid on the Waves network. In this case, the script attached to the asset is in charge of validating each transaction relating to it. As such, the smart assets are supposed to offer greater autonomy, anonymity and lower transaction fees. Two-tier architecture is designed to help the Waves deal with the potential scalability-related problems. This includes having the network maintain two types of nodes: lightweight and full nodes. The lightweight nodes rely on full nodes to confirm transactions and manage interactions taking place on the Waves network. Thanks to this, the lightweight nodes do not have to download blockchain, but rather work with the current network state. This state is subsequently used as the basis for running simpler procedures relating to the payment verifications. Leased Proof-of-Stake (LPoS) consensus model is described as the “enhanced” version of the Proof-of-Stake model and it works hand in hand with the WAVES tokens. Instead of running a full node, the users can “lease” their tokens to the full nodes that keep the network operational, at the rate of 0.002 WAVES per leasing. Once 1,000 WAVES tokens are acquired, a full staking node is created. Even if a user does not have the required amount of tokens, he/she can take part in staking by leasing their tokens to a mining pool. As of December 2018, the Waves’ market cap was valued at more than USD 178 million, down from USD 1.7 billion it had in December 2017. The amount of tokens in circulation is capped at 100,000,000 WAVES. The Waves ICO took place from April to May 2016, with USD 16.4 million raised in the process. The tokens are available for trading on the cryptocurrency exchanges such as Binance, Bittrex and others. The founder and CEO of the Waves platform is Sasha Ivanov, a theoretical physicist from Ukraine, who worked on the development of software and internet payment platforms and neural network prediction solutions. Before starting the Waves project, Ivanov was involved in the creation of the instant cryptocurrency exchange Coinomat.com, as well as in the development of the Nxt platform which served as an “inspiration” for the creation of the Waves.